I didn’t expect to write this post so soon after the last one. After months of nothing new happening, suddenly I write two posts on mathesis and Iamblichean number theory on the Tetractys? It’s good to be back, that’s for sure. I suppose this downtime since last year has done me good and given me time to internally process a lot more than I expected. Get a drink, dear reader, because I’m gonna go on at length for a bit here. Okay, so, last time, I started (again) contemplating this mathesis stuff I started developing back in 2014. Mathesis literally means “teaching”, and is the style of theurgy and ritual I’m developing as an exploration of Neo-Pythagorean, Neoplatonic spirituality based more on Hellenic philosophy than the Jewish philosophy inherent in Kabbala, mangled beyond recognition into Hermetic Qabbalah, and which has unfortunately formed a procrustean bed of occultism to which so much (maybe even too much) has been chained down by. To be fair, there’s a decent amount of Pythagoras in QBLH (regardless of whether it’s Jewish Kabbala, Christian Cabala, or Hermetic Qabbalah), but nobody really knows what Pythagoras actually taught. We know he was A Thing, but we don’t know which Things he was. And…well, I find lots of issues that’ve collectively poisoned the well for me in Hermetic Qabbalah, and I find it hard for me to go back to it anymore. Yeah, I still use the stuff when it’s called for in Western Hermetic ritual, but I want to find something better, hence my exploration of this system I’m (slowly) developing. A crucial aspect of it is focusing on the Tetractys, the sacred triangle of ten points that represent the fundamental ideal for all things in the cosmos. Yes, this path involves a lot of meditation on Pythagorean number theory, handed down to us by the Neoplatonists such as Iamblichus, so let’s go back to the basics and recall what we’ve discussed before about the numbers themselves. These relationships are, in a sense, a more “ideal” version of each of their correspondent numbers, and form a sort of meta-Tetractys. For instance, the Monad has the secret of individuation (a thing in the process of becoming a single thing), while the Ennead has that of realization (a thing in the process of becoming real); both reveal the secret of becoming, but do so in different ways. The numbers after the Pentad are reflections of the numbers going before, both reflecting off an ideal numerical concept. As a sort of exercise, let’s now take another look at that picture above. If you take the lower inverted Tetractys, it implies the existence of two boundary “hidden” tetractyes, such that the Hexad is really just a tetrad plus two monads, the Heptad a triad plus two dyads, and so forth. If we were to keep this all truly reflective, and if there are two “upright but hidden” tetractyes bounding the lower tetractys, then we should also envision two “inverse but hidden” tetractyes bounding the upper tetractys. 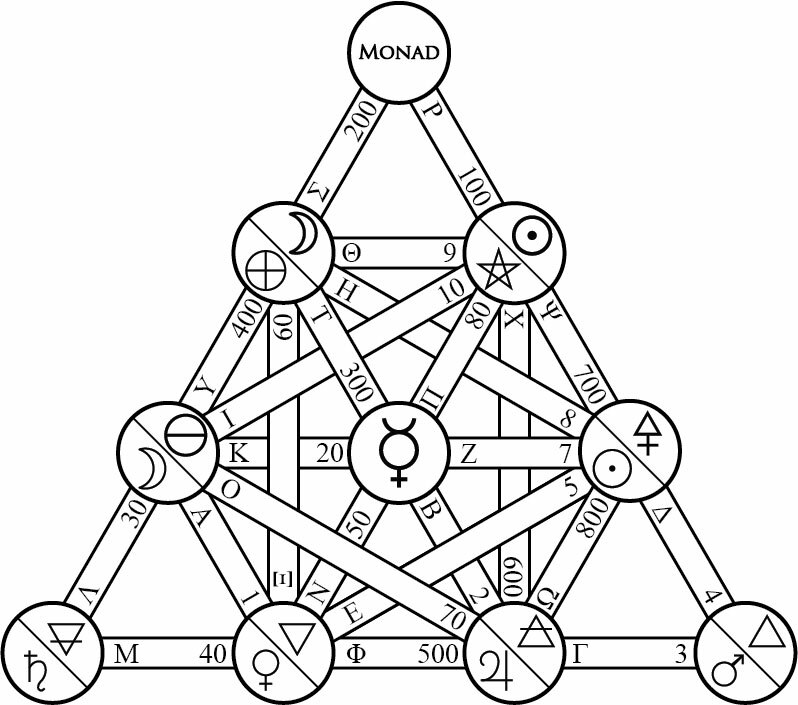 Thus, the Monad is just an ennead minus two tetrads, the Dyad an octad minus two triads, and so forth. I list the Pentad here as well, but it has no relationship to anything else, as it is not properly part of the Tetractys (either one, upper or lower, upright or inverse), and also because it is “hidden” as something apart, a balance around which the other two tetractyes stand. That said, if anything, the Pentad is part of a relationship with the Decad, being exactly half of it, and also thus in a relationship with the Mēden, nothingness and emptiness which is nothing more than the flip side of the same coin as the Decad. However, this all implies that the Monad is not truly just the Monad that is built with nothing before it, but that it is formed from subtracting from the Ennead. If we treat all numbers as equally and c0-eternally present, then sure, that would work, but that’s not how the ancients thought about these numbers. To them, the Monad was first, and underlies all other numbers without relying on them for existence. Thus, it is the Ennead that relies upon the existence of the Monad and not vice versa, so perhaps we shouldn’t rely on this way of conceiving relationships between the numbers. Alternatively, we might say that the “ideal” concepts of Becoming, Variation, Accordance, and Structure are identical to those of Individuation, Relation, Harmony, and Form in all ways, simply being another set of terms for the same exact things. This would mean then that the other four ideas of Realization, Mixture, Essence, and Order are reflections of the “pure” or “true” upright Tetractys, and not that they are on the same level being reflected from the “ideal” concepts. We might then conceive of Mixture being a higher “register” of Relation, that the Octad is a higher “evolution” of the Dyad, much as people claim Uranus is a higher “octave” of the forces of Mercury, or how 20 is a higher base of the number 2. 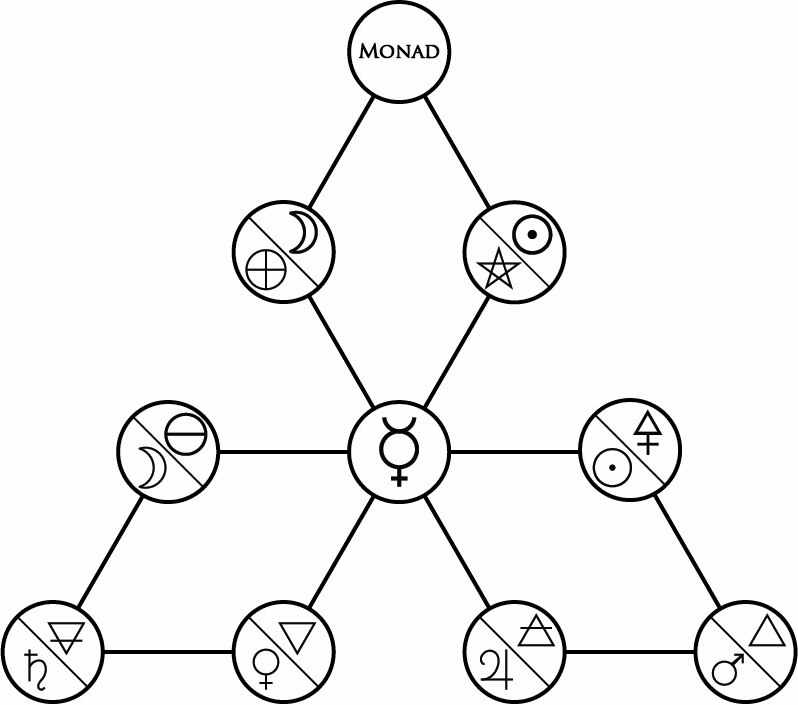 We first proceed from the Monad to the Dyad to the Triad to the Tetrad, then hit the Pentad. Then, upon reaching the Hexad (really the first higher register of the Tetrad), we go to the Heptad (higher register of the Triad), then the Octad (higher register of the Dyad), then the Ennead (higher register of the Monad), and then we hit the Decad, which you might consider to be a higher register of the Mēden. After that, we hit the eleventh rank (the Hendecad if you want to be fancy about it), which as we see is an even higher register of the Monad. Thus, the Dodecad (rank 12) is an equally-high register of the Dyad, the Tridecad (rank 13) of the Triad, and so on. Note, though, that just as the lower tetractys has two hidden upright tetractyes supporting it on either side, the tetractys of the ranks higher than twelve has four hidden tetractyes, two on each side of each type. Every time we finish one Tetractys of evolution (Becoming through Structure), we bring all of that with us each step of the way along the next time. 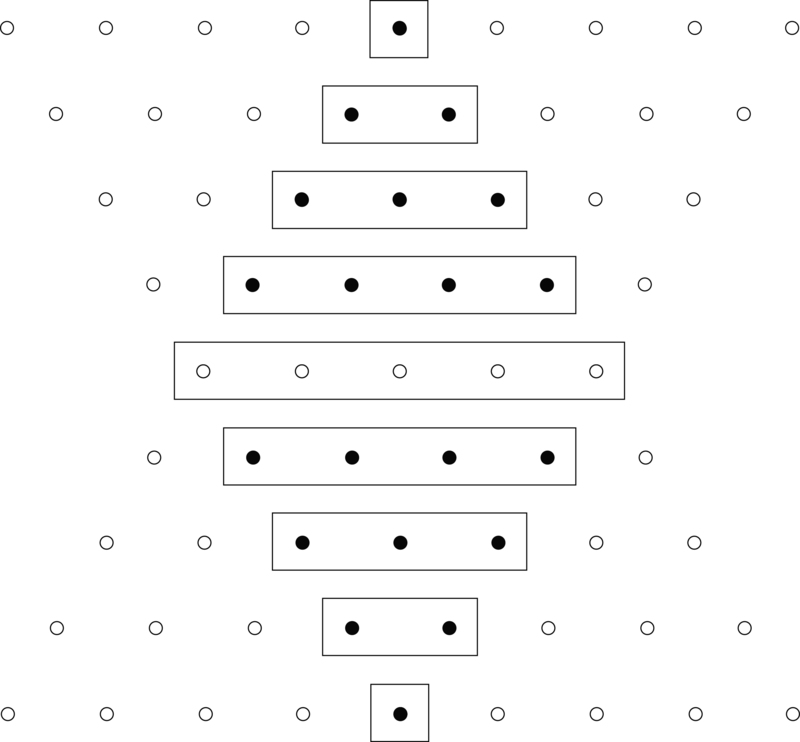 And, every time we finish the next Tetractys, we also bring that one with us, too; note how the third Tetractys in the picture above, ranks 11 through 14, is nestled between both upright and inverse tetractyes, one of each on each side of the central tetractys that we’re developing. Each time we progress, we build upon and bring with ourselves all that we have done before, again another way to describe the “everything eternally flows” concept of the Gnosis Schema mentioned last time. So, consider the Hendecad, rank 11. This row is composed of the Monad, plus two hidden upright monads and two hidden lower tetrads. The upper monad (rank 1) is associated with the pure concept of Becoming, i.e. Individualization, and the lower tetrad is really another way to describe the Hexad (rank 6), which is associated with Order. We know that Order is a higher register of the same concept as Form, i.e. Structure, and since we now have both Structure and Becoming together, we now have joined the Monad and Tetrad again in the same relationship we foresaw with our little mental exercise above. So the relationship between the Monad and Tetrad still stands, as does that of the Dyad and Triad. Good to know I didn’t have that little mental exercise or Adobe Illustrator use go to waste after all. So, let’s revisit the relationship between the Monad/Tetrad and Dyad/Triad and flesh those out a bit more. If we combine the numbers of these relationships and take the median of the sum, we can tease out some finer points of the relationships these numbers have amongst themselves. Monad and Tetrad. This pairing overall combines the concepts of Becoming with Structure, the formative beginning and end of all things that allow us to discern why we come into being, and as what we come into being. 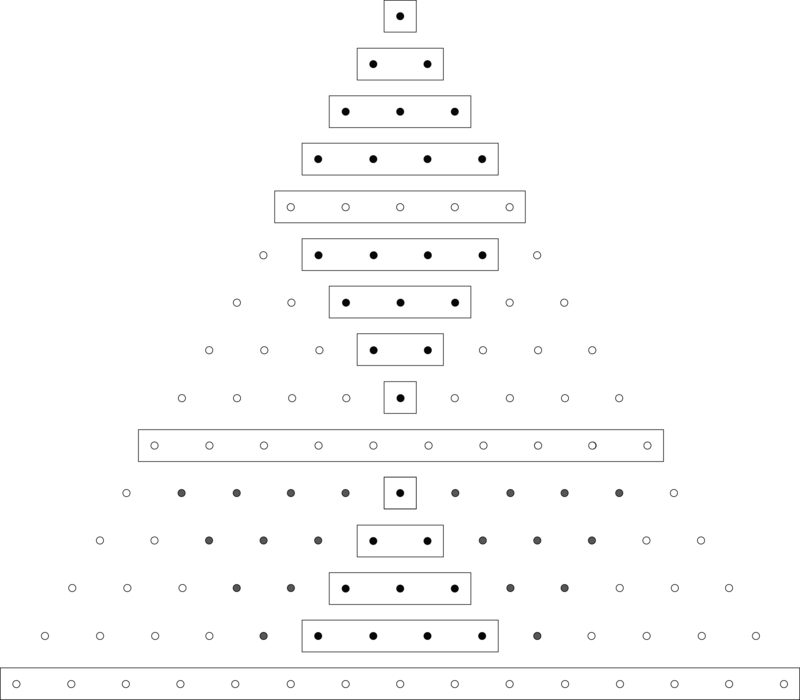 Upper Monad/Lower Tetrad = Monad and Hexad= 1 + 6 = 7, whose median is 4. Individuation and Order, with Form as the balance. As a thing comes into being for the first time, it focuses on its place in the overall order of the cosmos and universe into which it finds itself becoming. However, being initially without form, it thus requires one; the first thing anything requires in order to begin to achieve its goal is a form conducive to its goal and purpose. Lower Monad/Upper Tetrad = Ennead and Tetrad = 9 + 4 = 13, whose median is 7. Realization and Form, with Essence as the balance. As a thing becomes manifested and completed, it focuses on its form and how it will help it achieve its goal. With a form and a manifestation, what becomes the focus of investigation is now purpose, our essence, our telos within the overall cosmos. We reflect upon ourselves and our forms, having come into being, to question why and for what we come into being. Dyad and Triad. This pairing overall combines the concepts of Variation with Accordance, the principles of difference and similarity that relate to all things so as to learn what and how to achieve our desired ends. Upper Dyad/Lower Triad = Dyad and Heptad = 2 + 7 = 9, whose median is 5. 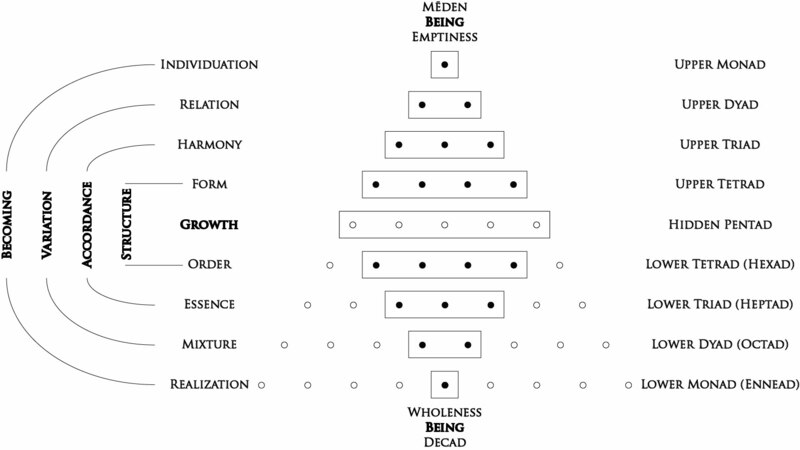 Relation and Essence, with Growth as the balance. As a thing comes into being and realizes what is around it and, moreover, what things are not itself, it learns to discern the essences of things, including its own, by means of comparison. This is not for idle sophistry; this very act of “know thyself” is a way of growing into ones own essence. We cannot escape our essence, but we can learn how to grow into it in a way conducive to its purpose. Lower Dyad/Upper Triad = Octad and Triad = 8 + 3 = 11, whose median is 6. Mixture and Harmony, with Order as the balance. As we fall into place and amongst our peers and all the other things in the cosmos, we learn how to get along with them. The sheer power of being mixed among things is the catalyst for attaining harmony, for the overall sake of creating an overall order so as to help us and all other things achieve all our purposes. All this leaves the issue of the relationship between the Pentad, Decad, and the Mēden. We see that, just as the Hendecad is a higher register of the Monad, and that the Hexad is a higher register of the Tetrad, we can say that the Decad is a higher register of the Pentad. But…this is a little weird. I mean, yeah, it logically follows, but we also know that the Decad is also a higher register of the Mēden, as both reflect a different state of Being. I mean, right? The Mēden is Being by Emptiness, where a thing that exists is empty of independent existence and relies entirely on all other things to exist; the Decad is Being by Wholeness, where a thing that exists is full of all things that exist, containing everything else. And yet, the Decad is nothing more than the liminal point between one iteration of the full Tetractys counted out and another; just as we started with the Mēden before the Monad, we start with the Decad before the Hendecad. In a sense, the Decad and Mēden are equals in their own relationship. What of the Pentad, then? The Pentad is the balance point between the Mēden and the Decad, and we associate the Pentad with the idea of Growth. Growth is a distinct concept from any of Becoming, Variation, Accordance, and Structure, as it builds upon and enhances them all. Consider that the Pentad is the only one of the numbers that can be formed in two distinct ways using distinct numbers in the sum: the Pentad can be formed by adding either the Monad with the Tetrad or the Dyad with the Triad. All the other numbers in the Decad have only one way to use distinct numbers to form the sum (9 = 4 + 3 + 2, 6 = 4 + 2, etc.) Even the Decad itself cannot lay claim to this little fact. The only other number that can be considered as special is the Mēden, which isn’t even a number according to the Greeks; it has no sum because it has no value, because it is nothing. Thus, in a sense, the Decad is conceptually equal to the Mēden, even if not arithmetically equal, because they are both Being in contraparallel ways. The Pentad represents growth because it affords the cosmos a power of balance, reciprocity, distribution and flow in a way utterly unlike any other number. It is neither static nor dynamic, neither oppositional nor reinforcing, neither varying nor assimilating, neither complete unto itself nor utterly and only part of everything else. In a way, it is Growth (Pentad) and Being (Decad/Mēden) that are also part of their own relationship, and if we’re to be proper about it, we would say that the Decad is a higher register of the Pentad, and not that the Decad is a higher register of the Mēden, because the Mēden doesn’t actually exist except as everything else (being completely empty of independent existence, like a kind of hypostasis or substratum of all numbers, as it were). So, let’s put this all together in a table for clarification, shall we? As above, we can identify Individuation with Becoming, Relation with Accordance, Harmony with Accordance, and Form with Structure; thus, all these concepts have the same number. However, we can distinguish between Individuation and Realization by saying that the former is “manifesting” and the latter “manifested”, like with our geomantic mental exploration of the Tetractys from before. Every time we traverse one of the three systems on this schema (Hot, Cold, or Cosmic), although there are four distinct paths and four distinct sphairai, there are actually five different steps. Consider the Hot System: we begin at Mercury, proceed to Jupiter/Air, then to Mars/Fire, then to Sun/Sulfur, and then back to Mercury. We proceed from the Monad to the Dyad to the Triad to the Tetrad to the Pentad…which then becomes the Monad for the next system. As we proceed from our starting point, we undergo a process of analysis and synthesis; as we return to our starting point, we complete this process and prepare ourselves for the next process. This completion/initiation point is the liminal sphaira of Growth, the Pentad, which is hidden from but implied by the numerical structure of the Tetractys itself. This way of reckoning the transitions between one system and the next as seamless might be considered ideal, thinking of the whole process of traversing the Tetractys as a Decad unto itself, although a bit forced in my opinion. Yes, if we start at Mercury, then we may not need to consider it as a distinct sphaira that we need to reckon again. However, this thought leaves a funny taste in my mouth. If we undergo the process of analysis and synthesis within one system after leaving Mercury, then when we return, we’re not the same person anymore, and Mercury will have new lessons to teach us before we proceed on to the next system. As we change, so do the lessons we must learn. After all, παντα ρει. Besides this, having twelve distinct steps to traverse the Tetractys is a pleasant echo of the twelve signs that the Sun passes through during the course of the year (and, additionally, is the fundamental thought behind associating these paths with the signs of the Zodiac and the rest of the letters of the Greek alphabet onto the paths of the Tetractys). So much for that issue, which turned out to be moot in the end. The other is actually more notable, and goes back to our analysis of the first four numbers of the Decad before the Pentad (Monad through Tetrad) as “manifesting” and the second set after the Pentad (Hexad through Ennead) as “manifested”, the Upper and Lower Tetractyes, respectively, and how they relate to the three systems. Say that we start at Mercury, and proceed around the Gnosis Schema along the twelve paths. We know that every time we complete a system, we have gone through five sphairai, beginning with and ending at Mercury. In this way, we get to experience both a manifesting and manifested version of each system, going through both the yin/yang, masculine/feminine, active/passive aspects of each force in turn. The first pass through the Gnosis Schema has us go through the manifesting/yang/masculine/active Hot system, composed of active and hot sphairai, then through the manifested/yin/feminine/passive Cold system, composed of passive and cold sphairai, and then through the manifesting Cosmic system so as to bring about divinity in our lives and worlds. However, this is only half the equation for a complete experience of everything. We would then need to undergo, maybe even “undo”, what we’ve done by continuing on the paths: we’d then undergo the manifested Hot system, then the manifesting Cold system, then the manifested Cosmic system so as to complete the process, and allow the divinity we’ve accomplished to become fully realized both within, through, and by us. I make this sound like going through the Gnosis Path once is pointless until you do it a second time, but it’s not. As we complete one iteration of the Gnosis Schema, we have gone through the ten states of the cosmos, the ten sphairai of the Tetractys, and have brought about completion. However, in doing so, we prepare ourselves by this very completion to continue along this path in another, more natural, more intuitive way. It’s akin to what’s said about one attaining K&CHGA in modern Western traditions: once you are under the tutelage of your Holy Guardian Angel, you complete your initiatory phase and begin your actual Work, since your HGA would lead you henceforth as teacher and tutor. What happens after that is continuing along the Lightning Path of the Tree of Life, but in different ways above the Veil of Paroketh that mimic what was done below it but in a greater, grander magnitude. To offer a parallel about this, I propose to think that that the first iteration of one’s trip around the Tetractys on the Gnosis Schema is meant to intentionally manifest one’s paredos or Agathodaimon by undergoing initiation in the three Systems, and the whole cosmos generally. It is only after that, under the direction of the Agathodaimon, that one allows what was intentionally manifested before outside oneself to naturally manifest within oneself, and vice versa, to the cumulative effect that one not only brings God down into this world (first iteration), but that we become God ourselves in all worlds (second iteration). I mean, I only propose to think this; I don’t yet claim that that’s what would actually happen, but it’s a useful way to think about it. If true Gnosis is to be attained, then one must experience both sides of all coins, not just the shinier side; the darker, more hidden side would be impossible to experience without the aid of the divinity we’ve worked to manifest, and to become manifested as divinity ourselves would be even less likely. If the manifesting and manifested aspects of the Tetractys are different, then going through each of the systems in its different aspect is as important as returning to Mercury after each individual system, since we are ourselves different after each individual process of analysis and synthesis.